Guppy is a minor character in Super Mario Galaxy. He is an orca who appears in a few of the game's missions. In two of the missions, he "takes over" a large body of water, and if Mario wishes to take it back, he has to swim through eight rings in a set amount of time. After Mario does that, Guppy rewards him with a Power Star. Guppy also appears in the Sea Slide Galaxy, Deep Dark Galaxy, and in the Mushroom Kingdom at the end of the game. If Mario touches Guppy, Mario bounces back on the ground and lose a Shell if he is holding one, but he won't take damage. Guppy's bark is definitely worse than his bite. This orca may look menacing, but he's really only aggressive to penguins and Toads. To Mario, Guppy is ultimately harmless, but he does present two challenges: he'll make Mario swim through eight rings in one body of water, and if Mario bumps into him, Guppy will bounce him to the floor. Look for Guppy in the Sea Slide Galaxy and the Deep Dark Galaxy. 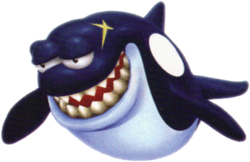 German Schatschi Based on the Japanese word for "orca whale"
According to the Prima guide for Super Mario Galaxy, Guppy was originally going to be a generic dolphin and a friendly character, despite him already being one, as orcas are a type of dolphin. The Prima guide also incorrectly referred Guppy to as a shark. 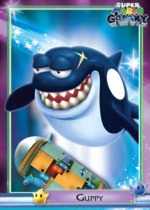 In the German version of the game, Guppy refers to himself as a shark instead of an orca. In the Deep Dark Galaxy, Guppy will still act as if he has met Mario even if he hasn't been encountered in the Sea Slide Galaxy yet. The Prima guides claims that Guppy is only aggressive to penguins and Toads. This may be a reference to how orcas are natural predators to penguins. This page was last edited on February 7, 2019, at 01:05.